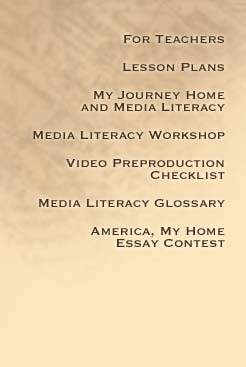 Once your students complete the media literacy workshop in this section, you may wish to challenge them to create a multimedia essay on the theme of America, My Home. Each essay should tell a personal story about what it is like for the writer to be an American, or the personal journey the writer has taken to be an American. These essays may be in audio, video or print media and should reflect one or more of the overarching themes of the documentary’s stories. All essays, regardless of format, must contain a specific reference (verbal or written) to My Journey Home. Written essays should not exceed 500 words, and may be submitted in HTML format with embedded artwork, photos or graphics. Video or audio essays should not exceed three minutes in length.